This month’s guest post from the Road Trip Teacher reveals a few ways to take you from zero to hero on the Mom-o-meter with just a few ingredients. Head on over to the site to check out America’s #1 Destination Learning Resources. This week’s FREEBIE includes a July 4th Copywork/Study Guide combo pack (print and cursive!). Our family is on the road this summer in the Midwest but has an official leap list of places we hope to visit some day on the July 4th holiday. I’ve found that it doesn’t take a lot of money or energy to turn an Independence Celebration into a July 4th Blast with these 7 quick easy tips. This year, my Roadschool 101 crew just finished up the July 4th Copywork/Study Guide so the Star Spangled Banner is ringing through our rig about once every 10 minutes. That made the perfect intro to the Rockets Red Glare Kabobs I put together for lunch today and went the kiddos outside to play. Yep, I said I sent them out to PLAY for lunch. I have a whole rig full of happy patriots today. 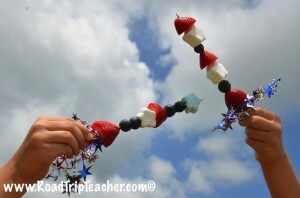 Click here to check out the 7 Ways to Make July 4th a Blast wherever in the world you are! 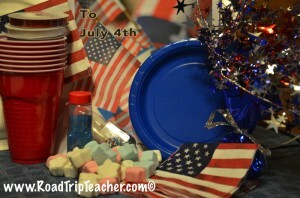 And if you’d like to check out a the Road Trip Teacher’s Patriot’s Guide to July 4th, just e-mail info@roadtripteacher.com to join their mailing list and you’ll receive your free copy compliments of Diary of a Road Mom. Happy 4t of July! !